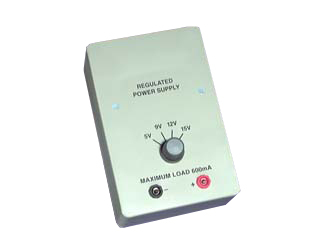 This single rail regulated power supply (IPC-0201-P) provides a smoothed and regulated DC output voltage over four ranges, each selected by a single rotary switch. The power supply is housed in a robust ABS plastic case and is ideally suited for all electronic tasks and experiments requiring a consistent and reliable voltage supply or voltage reference. The output voltage is via 4mm red and black sockets and ranges from 5, 9, 12 and 15VDC, all capable of supplying a maximum output current of 600mA.